Montgomery Gentry Say Goodbye to Record Label! Montgomery Gentry say so long to their longtime label, Columbia Records, Music Row is reporting. The platinum-selling duo was voted the CMA Duo of the Year in 2000, crowned ACM Top New Group/Duo award that same year, and has charted over 20 singles including 5 number 1 hit singles. 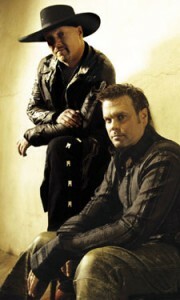 Montgomery Gentry’s latest release, ‘For Our Heroes,’ was distributed through Cracker Barrel as an exclusive release that sold 25,933 copies on its debut week, back in May of 2009. The very next month, the duo’s lifelong dream for came true, as Montgomery Gentry were inducted into the Grand Ole Opry. Montgomery Gentry’s upcoming compilation EP, ‘Hits and More: Life Beside a Gravel Road,’ is scheduled to be released on September 28. ‘While You’re Still Young’ — which was released in April 2010 and peaked at No. 32 on the charts — will be the lead single. There’s no official word yet on the reason for their departure from Columbia, but Music Row is reporting the split was amicable.